Jesus knew how they ticked, inside and out. And He knew how we would tick. He knew that people like you and me could see Him without really perceiving who He was, hear Him without really listening to what He was saying, and hang around Him without really getting to know Him. So Jesus challenged every assumption, cut through every "Well, of course..." and asked the key question. Who do you say I am? In Western culture, all of us have been exposed to the figure of Jesus Christ countless times since infancy. But HE is obviously not the weak, anemic figurine and figure head man's religions and philosophers make Him out to be. Who do YOU say that He is? Or more importantly by far - who does GOD say that He is? Why Was He So Exclusive? Aren’t all religions basically the same, anyway? How you answer that question from the heart makes ALL the difference as you look to the Father, or just look to the earth for lifeless religions of convenience and powerlessness. The Creator of the galaxies—and the Creator of every single small galaxy within every atomic particle in the Universe—came to visit his own Creation. He came to Visit our little earth, with our millions of poor and needy, sweaty and hungry, or proud and foolish inhabitants. We needed Him, and He came. Jesus chose to Visit us as a riddle and enigma, the ultimate challenge and the supreme blessing. He came robed in contradiction and poverty and chose to be born to a virgin in a small corner of the Middle East. He chose to experience us, for our sakes, and to first spend 30 years working hard with his hands as a poor laborer, a common wood-worker. But, He had something to Say, and something to Do in those last three years He was here physically. He had waited and watched, and in just the right time, in just the right place, in just the right way that would confuse all but the honest seekers, He was born into an oppressed and occupied impoverished land and time and race. And, now, He had something to Say, and something to Do. In spite of the Miracles He had performed in plain sight, and the laws of nature and physics He demonstrated He owned and controlled as no mere human ever has or could, in spite of the perfection of His life and the radically refreshing wisdom He brought to man—blistering the hypocritical and ritualistic religions of His day—they killed Him. But THEY COULD NOT KEEP HIM IN THE GRAVE! As He had done for over three years, He proved HE ALONE had the right to have the Final Word, the Only Opinion, the absolute Truth that matters. Debate over. NO ONE ELSE walks on water and commands the storms and heals the lame and blind, and raises the dead by Command. JESUS ALONE, Y’shua, has the Final Word. But thank GOD for that! HE ALONE is Relevant, rather than merely relative. Hear ye HIM! Whatever HE says, goes. Period. No one else can raise the dead but Jesus; no one else’s thoughts amount to more than a drip in the ocean of conflicting opinions. Hear ye HIM! Soon He will Crack the Sky and come back for those who are His! Will you be that man, that woman, that child that is looking and longing for His Return? His friends—probably with a surge of pride that their popular teacher inspired such interest and a wave of attention—repeated the latest rumors. Jesus was a “prophet,” perhaps even one of the old prophets of centuries past come back to life! Or maybe a reincarnation of the recently martyred John the Baptist! He knew how they ticked, inside and out. And He knew how we would tick. He knew that people like you and me could see Him without really perceiving who He was, hear Him without really listening to what He was saying, and hang around Him without really getting to know Him. So Jesus challenged every assumption, cut through every “Well, of course…” and asked the key question. Who do you say I am? Just another “prophet” or Santa Claus or moral Teacher or Mystic or Fairytale? This man Jesus from the Middle East, a man unlike anyone ever born, has been seemingly turned into anemic fable and emaciated fairytale by Western nonsense, sentiment, love of the world and things of the world, love of entertainment shows and superstition, and fake forms of Christianity that do not honor nor obey Him, nor reflect His Glory or look at all like the Family of Life and Love, His Church, that He birthed from Heaven. Jesus was lied about, mocked, slandered, accused, arrested, tortured, and sentenced to death for daring to take a stand AGAINST the ritualistic weak religions of rote words, empty promises, selfish isolated lives, and power-hungry medicine-men clergy. Who REALLY was and IS Jesus? How you answer that question from the heart makes ALL the difference as you look to the Father, or just look to the earth for lifeless religions of convenience and powerlessness, as mere men may do. “Who do YOU say that I Am,” He asks YOU, today! What would your personal response be? In your own heart, what have you made of Jesus? Let’s take a few minutes together to sort through our pile of assumptions. Let’s examine each assumption in the light of what the people who knew Jesus best had to say about Him. Many of them were present on that day in Caesarea Philippi and the testimonies of these people deserve our respect. Many of these men and women whose convictions are recorded in what we call the New Testament went to their deaths in the face of violent, hateful opposition, without wavering for a single moment in what they so confidently declared. These few pages can’t possibly do justice to the question of Jesus’ identity and significance. But let’s do give honest consideration to some of those men and women’s convictions about Him. As we read, let’s ask ourselves: If what they said is true, what would the implications be for my life? Those who had come to know the teacher from Nazareth proclaimed it shamelessly. They spoke of a Jesus “who, being in very nature God, did not consider equality with God something to be grasped, but made himself nothing, taking the very nature of a servant, being made in human likeness” (Philippians 2:6). Somehow, crammed into this fully human package was the infinite nature of God in all His awesome attributes. Right before their naked eyes was a sight never seen before: “He is the image of the invisible God…God was pleased to have all his fullness dwell in him” (Colossians 1:15,19). This man was precisely like God. He was as inseparable from God as the light radiating from the sun is inseparable from its brightness: “The Son is the radiance of God’s glory and the exact representation of his being” (Hebrews 1:2). Jesus’ very closest friend during those few years in the spotlight summed up his convictions about Jesus in three short phrases. “In the beginning was the Word, and the Word was with God, and the Word was God” (John 1:1). Jesus didn’t just teach about God, or try to show an example of God, or promise to lead someone to God. Jesus was God. Shocking words! Yet those were the very words used by this man who knew Jesus so well and who had walked so closely with Him all those years. He made you FOR HIM! Modern scientists, straining to hear the echoes and whispers of the universe’s origin, have discovered a time when nothing existed. Nothing. The universe was less than empty space. There was no space then to be empty! All that existed was a single point with no dimensions or size. Suddenly a cosmos sprung into being, pulsating with energy and mass. Vast forces somehow shaped that meaningless chaos into beauty, purpose, and order in every direction we look. Somehow a nothing became a something, and that something became a loved one’s voice and a baby’s smile. Jesus’ friends knew it all didn’t happen by chance (as some scientists would have you believe). They believed He did it. By Faith, they understood “that the universe was formed at God’s Command, so that what is seen was not made out of what was visible” (Hebrews 11:3). They testified that His Holy command brought the worlds into existence and that His wisdom infused creation with meaning and direction. They taught that we personally owe our existence to Him. “In the past God spoke to our forefathers through the prophets at many times and in various ways, but in these last days he has spoken to us by His Son, whom he appointed heir of all things, and through whom he made the universe” (Hebrews 1:1). The Person whom we know as Jesus is our Creator. “Through him all things were made; without him nothing was made that has been made” (John 1:3). Why do I exist? Those who knew Jesus best would answer: because He made you for himself! “For by him all things were created: things in heaven and on earth, visible and invisible, whether thrones or powers or rulers or authorities; all things were created by him and for him” (Colossians 1:16). He made you FOR HIM! Those who lived with Him declared: He is our Creator. Some have imagined an impersonal, distant Creator who set the universe spinning like a top, then withdrew to a distant vantage point, waiting for it to wind down, wobble, and topple over. Those who really knew Jesus KNEW differently! Our next breath and heartbeat depend on Him. Their conviction? Yes, Jesus is God. He did speak the cosmos into being. But He is still very much involved. In fact, the continuing existence of our universe depends on Jesus sustaining it! “The Son is the radiance of God’s glory and the exact representation of his being, sustaining all things by his powerful word” (Hebrews 1:2). Without Jesus, everything would fall apart: “He is before all things, and in him all things hold together” (Colossians 1:17). No matter how self-sufficient we act or self-reliant we feel, our next breath and heartbeat depend on Him. Due to His friends’ testimony, the “visible” side of Jesus’ career has become well known. He lived, loved, taught, and healed for three years. Jealous, ambitious religious leaders played on the paranoia of the civil authorities to get Jesus killed. They executed Him as a common criminal with a cruel torture. On the third day, however, His companions discovered an empty tomb. Over a period of six weeks, Jesus began to visit them individually and in groups—around 500 people saw Him, ate with Him, and talked with Him first hand during that period. So far, we are in the realm of the familiar. Hollywood blockbusters and Easter TV specials have repeated “the greatest story ever told” often enough that most people in the western world know those basic facts. No thinker or teacher or leader on earth, no angel or demon or force in the spirit world, can challenge the Supremacy of Jesus Christ—now and forever. But there’s much more! Jesus’ companions also proclaim to us what happened to Him after the resurrection. “He humbled himself and became obedient to death—even death on a cross! Therefore God exalted him to the highest place and gave him the name that is above every name” (Philippians 2:9). According to their testimony, Jesus at this very moment occupies the highest place in the created or uncreated realms. His name carries greater weight, honor, and authority than any other. No thinker or teacher or leader on earth, no angel or demon or force in the spirit world, can challenge the Supremacy of Jesus Christ—now and forever. God had to exert great power to raise Jesus from the dead. But that power did not stop working when Jesus came back to Life! It kept on raising Him, higher and higher, until He reached that place of unchallenged authority. “That power is like the working of his mighty strength, which he exerted in Christ when he raised him from the dead and seated him at his right hand in the heavenly realms, far above all rule and authority, power and dominion, and every title that can be given, not only in the present age but also in the one to come” (Ephesians 1:19-21). Jesus’ elevation to the highest place may not be nearly as well known in our day as is His death on the cross or resurrection from the tomb, but those early eyewitnesses were adamant about it. “After he had provided purification for sins, he sat down at the right hand of the Majesty in heaven” (Hebrews 1:3). “He is the beginning and the firstborn from among the dead, so that in everything he might have the supremacy” (Colossians 1:18). These men and women confront us with a proclamation with stunning implications. What will we do with this Jesus? • Jesus was God! He is God! And will always be God! • He created the heavens, the earth, principalities, powers—everything in all creation. And to this day, He continually sustains it and every creature in it—including you and me. • He gave up every position and privilege and right of equality with God. He intentionally did this for a time so that He could become one of us. His Father rewarded His obedience and sacrifice by elevating Him to the Supreme Position in the universe—with the Name that is above every other name. So what is Jesus doing now? “In Christ all will be made alive…Then the end will come, when he hands over the kingdom to God the Father after he has destroyed all dominion, authority and power. For he must reign until he has put all his enemies under his feet” (1 Corinthians 15:22-25). For the remainder of history, Jesus’ authority over all creation—angels and demons, forces and powers, and you and me—will increase. Eventually every force, including death, will submit to His authority. He will then resurrect all who willingly embrace Him and He will hand this Kingdom of people (of friends) over to His Father. Sooner or later we will all recognize Jesus for who He REALLY is. Then everyone will be resurrected. In the face of Jesus’ unchallenged supremacy, all will be humbled! The most powerful dictators and proudest rulers on earth will meekly drop to their knees and admit that Jesus is Lord. A staunch enemy turned devoted friend of Jesus put it this way: “God exalted him to the highest place and gave him the name that is above every name, that at the name of Jesus every knee should bow, in heaven and on earth and under the earth, and every tongue confess that Jesus Christ is Lord, to the glory of God the Father” (Philippians 2:9-11). According to this testimony of Jesus’ first followers, my knee will eventually bow to Jesus and my tongue will confess His authority. And, so will yours! Sooner or later we will all recognize Jesus for who He REALLY is. The decision on whether to embrace Him lovingly now, or to wait until it is too late, is of ultimate importance! Wow. Jesus actually claimed He was the only way to God! We’ve focused on what Jesus’ friends and followers said about Him. And all evidence then and now shows that His own view was and is entirely consistent with theirs. Listen to some of His radical statements. If you’ve heard them before, pretend you haven’t. Let their full impact hit you. “I am the way and the truth and the life. No one comes to the Father except through me” (John 14:6). Wow. Jesus actually claimed He was the only way to God! And He didn’t misspeak because He kept on saying it: “I tell you the truth, I am the gate for the sheep. All who ever came before me were thieves and robbers, but the sheep did not listen to them. I am the gate; whoever enters through me will be saved” (John 10:7-9). Is Jesus really saying that no other person, religious leader or otherwise, has the ability to reveal God? “All things have been committed to me by my Father. No one knows the Son except the Father, and no one knows the Father except the Son and those to whom the Son chooses to reveal him” (Matthew 11:27). Perhaps these claims sound offensive. But let’s put them in the context of the testimony we’ve just heard. Since Jesus really is the exact image of God, He could make God known like no one else could. Since all of God’s fullness lives inside of Jesus, His words would have to contain that fullness, too. And since Jesus really has been exalted to the highest place, with a Name above all other names, no one else’s opinions or guesses or philosophies really matter all that much. Jesus didn’t just claim to speak truth. He proclaimed He is Truth. He didn’t promise to show the way. He said He is the Way. And for God, those assertions are neither arrogant nor insane. They’re simply true! You can choose your religion like a person in a cafeteria line chooses lunch...But according to Jesus’ own words, this cannot be so. Historically, “overcoming depression” is accomplished by men in many ways. Religion, “the opiate of the people,” has long been used in every culture to salve the conscience and psyche. Human emotion and sentimentalism are NOT to be confused with BIBLICAL CHRISTIANITY. Let’s be realistic! All world religions have “something to offer”—or there would not be so many millions of adherents to those religions, from Hare Krishna, to Voodoo, to Catholicism, to Islam, to Moonies, to New Age, to Buddhism or Taoist thought! It is a very common fallacy that all religions are really the same—all teaching the same moral principles and all talking about the same God. According to this view, you can choose your religion like a person in a cafeteria line chooses lunch—just based on personal preference or cultural comfort zone. But according to Jesus’ own words, this cannot be so. Jesus won’t consent to being an entrée choice. In Reality, He is to be the whole banquet! All religions really aren’t the same. Eastern religions are quite diverse, but generally they teach that God is a Force, with no name or personality, existing in all things. The goal is to give up your identity and melt into this mindless thing. Tribal religions, in contrast, tend to believe in personal gods—usually a whole bunch of them. The most important gods are often a person’s own ancestors, whom he or she must appease with the proper rituals and gifts. Western religions (including some under the name of Christianity) mainly emphasize doing good deeds to earn eternal rewards from a reluctant God. Westerners tend to be very individualistic and goal oriented, even in our religions. No matter how “good” it feels, “liturgy,” hierarchy, traditions of men, and all... are a placebo—NOT the Real Place Jesus has invited us into! But you know what? The Creator God decided to become one of us. He wanted to provide us a way to know Him by becoming the way. He is reigning now, His authority increasing each moment. All those who have known Him encourage you to bow your knee to Him now. Come to love Him, and get to know Him. His reign will soon be complete. So center your lives around a loving devotion to this person, and you don’t have to play the religion game at all. And if Jesus spoke the truth, there’s no way to win that game anyway! It is Scripture—the Life and Teachings and WAYS of the Master, Jesus, that define our lives and teachings and ways. “LITURGY” IS NOT CHRISTIAN!! “Liturgy” (pre-programmed, pre-planned speeches, music, services, chants, sequence of events) contradicts and disobeys the teachings of Jesus and the recorded ways of how he lived with His followers then, and therefore NOW!!! (He is RISEN, and the SAME! He is NOT now changing how He relates to His Followers. Do you really believe He chanted with them, burnt incense, did “responsive readings,” sang hymns pre-selected, practiced, and posted, or wore special clothing for a “weekly service”?? Did HE ever practice “sermons” in a mirror, from notecards? Come on now!! : )) No matter how “good” it feels to our emotions and hurts, “liturgy,” hierarchy, traditions of men, and all... are a placebo—NOT the Real Place Jesus has invited us into! What’s it worth to learn to FLY??!! “Joy inexpressible, full of GLORY”—“the Power of an Indestructible Life”—“Rivers of Alive Water gushing from within”??!! God’s ways are best. No doubt in my mind! If you want to be your own King, then you’ll need to save your own soul from the eternal inferno that Jesus spoke of often. Let’s return to that seacoast town where Jesus had gathered His friends. The challenge of His question—“What about you? Who do you say I am?”—is ringing in their ears. One man speaks up with conviction: “You are the Christ, the Son of the Living God.” Now each person in that group must wrestle through that question. As we have seen, they unanimously come to the same conclusions. Jesus is the Christ—a word simply meaning the anointed king or ruler. And He is the Son of the Living God—meaning that He is God himself. Jesus was thrilled with that answer! “You are blessed, because this was not revealed to you by flesh and blood, but by my Father in Heaven.” The lives of the people in that circle who embraced the answer were never the same again. And now, across the miles and the centuries, Jesus turns His face from that little group of friends and looks us in the eyes. He searches us silently for a moment, then asks us that same life-changing question: Who do you say I am? Will you act on your answer? If you want to be your own King, then you’ll need to save your own soul from the eternal inferno that Jesus spoke of often. Not much chance you’ll pull that off. None, in fact. So, you’ll have to live and die with your decision, and accept the consequences of your known rebellion before God. God doesn’t strike us with lightning bolts. He allows us to make a simple decision. 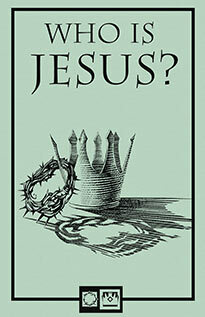 If, on the other hand, you answer by saying, “Jesus is King! He is Master! He is Creator and worthy to be praised and obeyed as my all-in-all”—then will you live like you believe this? You can go on from here forgiven of everything that you have ever done in your whole life with an expectation of the wedding feast of the Lamb, when we walk up into the arms of God and share in all of His Glory. The choice that you are making as you are sitting there is whether you are going to go on with your heart as a harlot, or go on with your heart as a virgin. With your life as dead in your transgressions…or alive to Christ Jesus. Enslaved to satan and a child of wrath…or a child of God and co-heir with Christ of all the riches of God. That’s as practical as I can give it to you. I don’t think you will have another chance that will be any more simple or straightforward. God doesn’t strike us with lightning bolts. He allows us to make a simple decision. Bend your knee to Him right now. It doesn’t matter who is watching. They are just mere mortals, a few pounds of carbon and water in a bag of skin. Don’t worry about their opinions. They can do nothing to save your soul, or to harm you. But if Jesus Christ, Lord of heaven and earth, is calling you…then bow your knee! Now, find others that are not mere attendees of Sunday religious facilities, rather, find those churches and people that are really living it, everyday, no compromise. It’s worth everything. Do it!